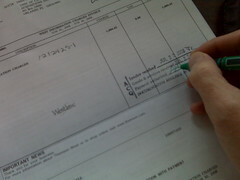 A little favoured task of artists... Invoicing. ...But you might as well know and understand your options. Fortunately there are several. Paypal is a free solution for online invoicing. It's the one I use the most often, even though I did buy a desktop solution. It allows as many clients as you want, though it's invoicing interface isn't as pretty as the invoice-only online solutions. However, since most people online nowadays pay and buy via PayPal, it's a succinct, accessible solution. Siwapp is an open source invoicing site that has a great looking interface. The site comes with a Community section, which can help with questions you may have. Every application is slightly different, but at the price of free, it's worth trying out to see if it meets your needs. There are other free, open source options out there as well, so be sure to do some homework and look them up if you feel Siwapp doesn't quite meet your needs. Invoice More offers a tiered pricing plan, which is common with online invoicing apps. The free version allows you to test it out and see if it meets your needs. Both free and the $15/mo plan offer unlimited invoices, recurring items, PDF generation; emailing and PayPal Standard payments. The paid plan offers credit card payment integration, unbranded emails for a more personal touch and Secure SSL Encryption. There are many, many invoicing products like this that offer a limited free account option. I find that the free accounts are usually too limiting for an illustrator, as we have a lot of different clients, but perhaps you can finagle it so it can work for you. FreshBooks is the self-proclaimed leader in online invoicing that has popularity with a lot of different types of freelancers. It's geared to a small business, accommodating several employees, which is a feature that is probably not much use to artists who usually operate via sole proprietorships. It has a tiered price plan with the free version allowing for three clients and all the options of the other price plans except it has branded emails and no project managers, time management and team expense reporting options. There are many pros to online invoicing. The ease of access to your information on the go makes this a great solution. Also, cross-platform issues become non existent, as these options work on your Mac or PC. The sheer volume of choices make it really easy to pick the best solution for your business. This can also be the start of the downside. It can be hard to pick a solution that has everything you need and it can be time consuming to go through all the options. You should be careful that the solution you pick offers a sufficient level of protection and security, as being online provides more risk than being on a desktop with no access to the internet. I feel the pros of online invoicing outweigh the cons and my solution through trial and error is simply just PayPal. Billings is the desktop app that I decided to buy. It worked well and makes nice looking invoices, but I ended up not using it much because it was a chore to keep track of the invoices and income as it all had to be entered manually. It also is Mac only, which is common platform for a lot of desktop invoicing solutions (at least the pretty ones), but this can single a lot of people out of using them, especially artists who are pretty even in Mac/PC usage. This is a free option for both Mac and Windows. It lacks a bit of the polish of Billings, but most of the functionality remains. There is a pro version for those who need more than five users, which probably won't include many reading this article! I say give it a go and see if it does what you need. If you dig, you can find more options, but they generally fall under the Mac-only, moderately expensive or "free-but you get what you pay for" model, which doesn't work for a lot of people. The pros of having desktop invoicing software is that it allows you to work offline and still invoice. Another is some desktop applications have accompanying smart phone apps which allow for "on the go" invoicing. The manual entering of each invoice to track records and sales can be tedious and time consuming, especially when you have deadlines. Many desktop solutions don't brand their name on the invoices, so it allows for better customisation. You'll just have to experiment with online and desktop software to see which option works best for you. Do you use any invoicing software not on this list? What are it's pros and cons? Leave a comment!